Leslie is a co-founder of Eugene’s Bold Betties, an all-women outdoor adventure group for all ages and experience levels. Giving women the outdoor experiences she had growing up, while inspiring others with her resilience and boldness, are part of her daily mission. She is a former ODF wildland firefighter and is currently an insect biologist. Leslie Dietz shows her 6-year-old son Grafton a millipede taking hold of a small twig during a family hike in McKenzie Bridge, Oregon. Leslie points to the sticks thrown into the water as they are carried into the main current of the quick-moving McKenzie River. Leslie has a talk with Grafton about not getting too close to the river, something she has warned him about before. Leslie places her hand around Grafton’s neck as Daniel drives the family back to Eugene. Leslie sits in her state-owned truck at the end of her workday in Florence, Oregon. She works “four tens,” or ten hours per day, Monday through Thursday. Leslie fixes a Florence, Oregon landowner’s apple tree with a LBAM (Light Brown Apple Moth) trap, which contains pheromone to attract the invasive Gyspy Moth, as well as a sticky residue, which will trap the insect. Leslie stops to talk to a Florence homeowner and dog-breeder who is about to take six of her bloodhounds for a walk. 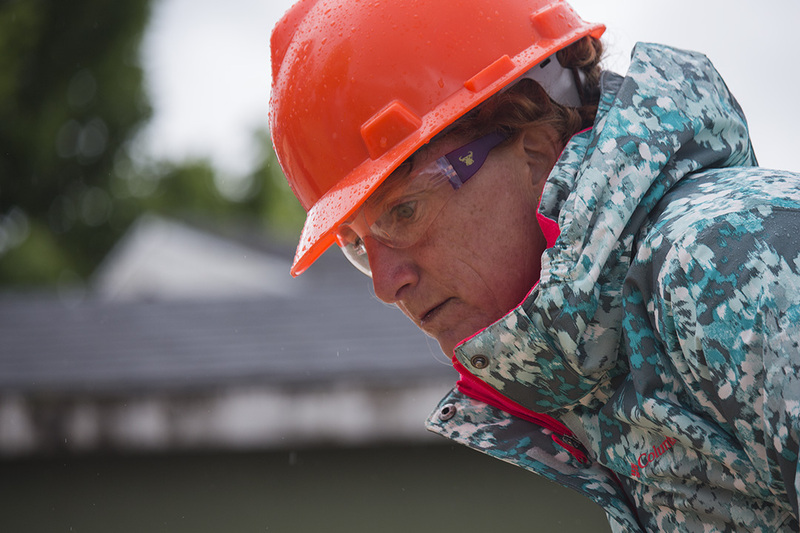 Leslie Dietz and other women participating in the National Women Build Week 2017 with Habitat for Humanity nail the final piece of plywood into the deck of a Harrisburg house, completing a tiresome seven-hour day with moments of rainfall interspersed with rare moments of sunshine such as this one. The last one working, Leslie double checks the nails in the boards after a full day of volunteer work in Harrisburg, Oregon. Leslie scrubs down an outdoor porch table she got after she traded in her larger table. Grafton is eager to help out. Dinnertime has come and the family is together for a brief moment as 17-year-old Cassie asks to take the car out to see a movie with friends. Cassie takes a break from climbing with her friends from South Eugene high school to spend a moment with her mother, Leslie, as they scout for their next climbing route at Crux Rock Gym in Eugene, Oregon. Leslie says she learned a different belay technique in Texas, which is why the technique she is using here seems odd to her. But she gets the hang of it quickly. Leslie and her daughter Cassie spend a moment together between climbs at Crux Rock Gym in Eugene, Oregon during the gym’s weekly women’s night.